The Way We Consume Information has Changed. In the past twenty years, we have witnessed dramatic changes in the way we consume our content. Successful sales representatives must understand that clients and prospects expect content that is relevant to their interests. But they should also be privy to the reality that different audiences prefer to consume information in different ways. Some individuals are most inclined toward video demos. Others want to interact with 3D virtual objects that allow them to delve deep into specific internal product parts. Still others favor multimedia case studies. No matter what their individual preferences for engaging with a product are, virtually all audiences want to consume information both efficiently and quickly. The status quo files and folders structure is not only ineffective, but often times sends the message that you are unprepared to discuss the customer’s specific needs. Customers prefer to consume only what’s relevant to them and have little time (or patience) for anything else. 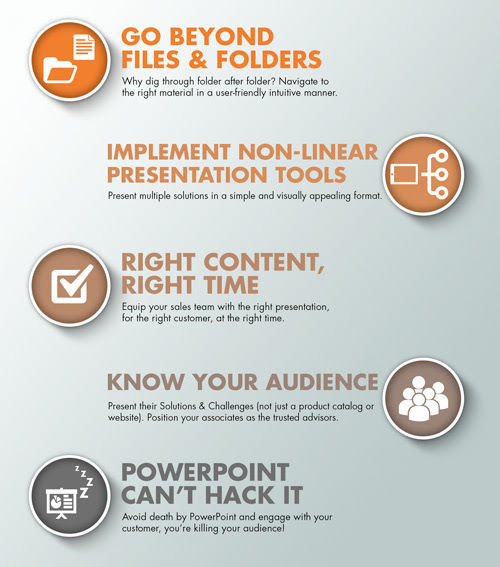 They want presentations that not only address their specific needs, but also answer the deeper detailed questions when they arise in the conversation. Those companies who are leveraging today’s available technology are enjoying far greater sales successes than their counterparts whose tactics are limited to “I’ll get back to you on that”, “let me drop off a demo later”, or the always awkward ”I know it’s here, somewhere”. Successful sales associates understand that their potential customers expect content that is relevant to their interests, and they don’t want to wait for answers. Tools, such as Command.app, add new dimensions to conversations, allowing associates to situationally access and present specific product information or materials tailored to the potential customer’s needs. The one-size-fits-all product pitch is a thing of the past. Today’s customers want to know what’s relevant to them, and to acquire this information in a time-efficient and easily comprehensible manner. So, what do you do? Associates spend hours doing their due diligence researching the prospects, taking educated guesses on potential need, but how about being prepared for any situation? Communication apps, such as Command.app, also offer major advantages to businesses seeking to capture information from the field and incorporate it into their marketing strategies. Likewise, such tools can dramatically streamline the processes of creating market-specific messaging and providing remote teams with the most up-to-date product information. In other words, with Command.app, everything you need to present your product or service—and to cater your presentation to the audience at hand—is on hand anytime, anywhere. Technology is bringing about exciting new changes to the way information is presented. There’s little doubt that prospects can seem impatient, hesitant, and forgetful given the immense pressure they feel to maximise their work related meetings under tight time constraints. For sales representatives, remaining competitive in this environment means creating an experience that holds the attention of your audience and, in turn, keeps them coming back for more. So, you did your due diligence and built the perfect PowerPoint. All the right people are in the room, and you’re psyched about the opportunity. What could go wrong? Should we go on? You get the point, we’ve all been there. A business communication app, such as Command.app, which offers a powerful yet user-friendly assortment of tools for optimizing your sales experiences—can help to set your product or service apart from the countless others. Whether you’re striving for utmost convenience in the form of a dynamic sales app or looking to dramatically enhance your product demo with an interactive experience, Command.app’s solutions can thrust your product presentation into the realm of cutting-edge. Moreover, Command.app can yield fewer lost business opportunities by placing product information and other materials at the user’s fingertips—a necessity in the fast-paced world of sales, where a moment’s delay in acquiring the information he or she needs can be enough to dissuade a potential customer. Command.app clients are making this transformation from traditional slide presentations to “modernize” their sales force and customer communications. 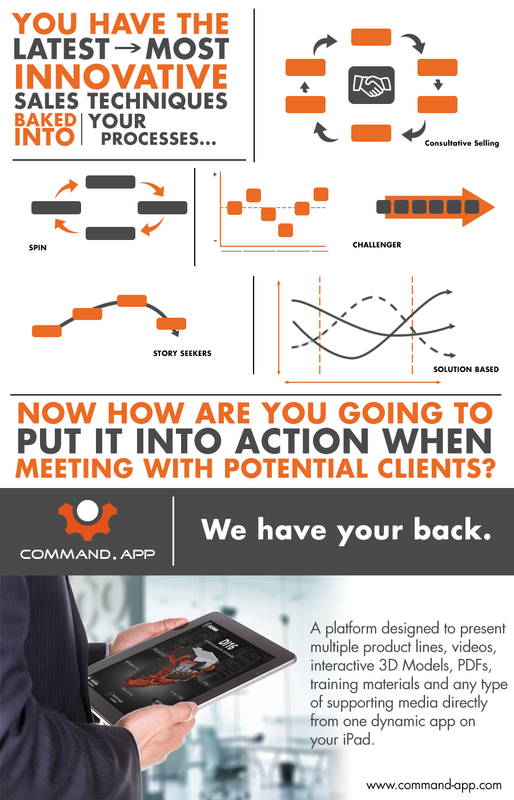 With the Command.app solution, today’s business professional will be equipped with the most effective B2B Situational Sales Tool on the market!